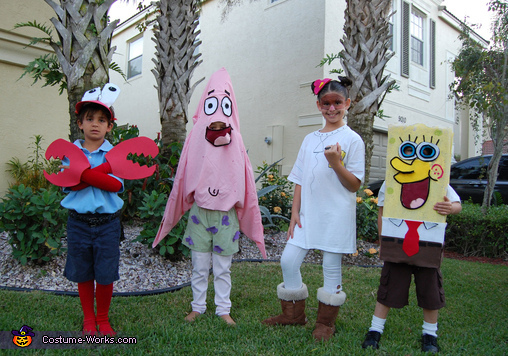 This homemade costume for kids entered our 2012 Halloween Costume Contest. My kids are wearing the costumes that I made. I spent a total of $10 on all four costumes. I made the Spongebob out of a box, some foam shipping stuff, and felt. Patrick is made from a piece of fabric sewn into a triangle and felt hot glued on. I also tacked some purple flowers onto a pair of boxers we had. Mr Krabs is made from foam sheets for the hands and felt and pipe cleaners for the eyes glued onto a 50 cent hat. Sandy was made from a t-shirt. I had lots of fun making them and the kids had fun wearing them.